"I've been here all my life and I've never seen the water hit the end of the pier the way that it's doing," the mayor of Panama City Beach said. As Hurricane Michael menaced the Florida Panhandle with howling winds and dangerous surf, residents riding out the storm in the popular resort town of Panama City Beach witnessed just how damaging it could be. Videos on social media showed 155-mph winds ripping tarps off roofs, new housing on the beach collapsing into the encroaching waves and buildings completely flattened or covered in debris. 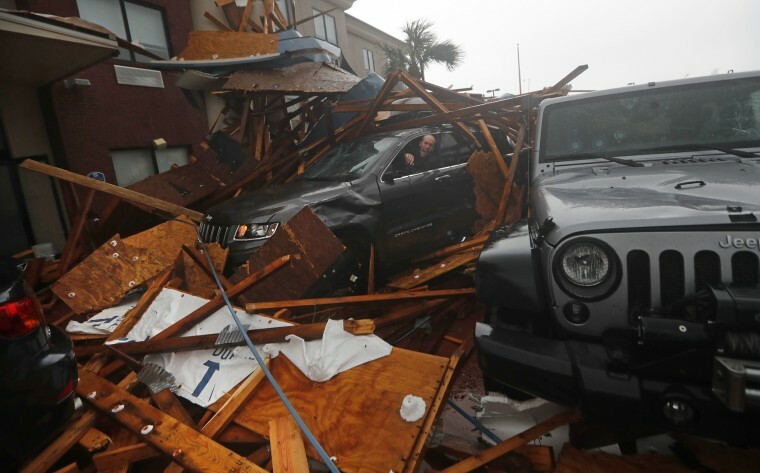 "The resort next to us is completely demolished," said Lisa Dawn Parker, 51, who has lived in Panama City Beach for almost three years and took cover along with her boyfriend in a friend's apartment near the beach. "The windows are blown out. The whole front of it's gone," she said in a phone interview with NBC News Wednesday after the storm hit. "We didn't think it was going to be worse than [Hurricane] Ivan," she said. "We don't know why we stayed." She said there was "lots and lots of wind and debris," and that "the rest of the beach is getting tattered with waves. The water looks like it's gone up to the dunes from here." The hurricane had maximum sustained winds of 155 mph when it made landfall Wednesday morning, making it a Category 4 — but it has since been downgraded to tropical storm. Two people have been confirmed killed: A man died when a tree fell on a residence in Greensboro, Florida, and an 11-year-old girl died in Seminole County, Georgia, when she was struck in the head by part of a metal carport that crashed into the roof of her home, authorities said. Now-Tropical Storm Michael made landfall as the strongest hurricane to hit the Florida Panhandle in recorded history. More than 338,000 customers in Florida and 343,000 in Georgia were reported to be without power. Another 125,000 people were without power in the Carolinas and Alabama. "I've been here all my life and I've never seen the water hit the end of the pier the way that it's doing," Panama City Beach Mayor Mike Thomas told MSNBC before the storm made landfall Wednesday afternoon near Mexico Beach, a sparsely populated town about 28 miles to the southeast. He said he was disheartened that a number of the town's 12,000 residents failed to evacuate ahead in time, instead choosing to shelter in place. Even if they wanted to, all of the bridges in the county were deemed unsafe and closed earlier Wednesday afternoon. "If you're going to live in a beautiful place, there's always some kind of problem with it, and this is truly beautiful, even now ... it's just a shame [the hurricane is] so destructive," Thomas said. The Gulf Coast resort town — and the larger destination of neighboring Panama City — has beckoned vacationers and spring break partiers for decades with its emerald waters and sugar white sands. Last year saw a record 17 million visitors to Panama City Beach, bringing in $2.8 billion worth of economic activity, according to a local tourism report in March. MTV's "Jersey Shore" spin off, "Floribama Shore," is also filmed in Panama City Beach. Michael is now the first threat of its magnitude to strike the area since record-keeping began more than 165 years ago. Since then, no Category 4 storm or higher has ever hit the Florida Panhandle, researchers say. In addition, Michael's peak winds at landfall were the fourth strongest on record for a hurricane slamming the U.S. mainland, just behind Andrew in 1992, Camille in 1969 and the biggest — an unnamed storm in 1935. Observers are concerned this one will shred pockets of the treasured coastline, part of a larger 100-mile stretch dubbed the Emerald Coast. High-rise condos and homes dot the beaches. "This is absolutely going to devastate Panama City Beach," said Jason Senkbeil, a University of Alabama associate professor of geography who has researched hurricane evacuees. Abnormally warm waters in the Gulf this October has fueled Michael. "There's lots of damage in my neighborhood," Sarah Shelley, a lifelong resident of Panama City which is near Panama City Beach, said in a phone interview with MSNBC Wednesday afternoon, describing rainy and windy conditions even after the monster storm hit. "We weren’t quite expecting it to get quite so strong so quick," she said, although she added that her home is in a "pretty high area" outside of flood zones. Still, her back porch and carport blew away in the fierce winds, she said. Like many in the region, Shelley lost power, but she said they have food and water and her parents who live up the street have an RV so they can cook food if necessary in the hurricane’s aftermath. Besides tourism, Senkbeil said the local agricultural industry, which includes peanuts and cotton, could suffer now because it's harvest time. "There's going to be a high-dollar value in terms of economic farm loss," he added. In addition, the area is laced with two-lane roads and pine trees. Heavy winds could block access to streets as well as isolated fishing villages. "Those pine trees are tall and skinny, and they're gonna snap like twigs under 150-mph winds," Senkbeil said. Osama Albibi said he, his wife and three young children evacuated Tuesday night from Panama City Beach to Panama City to stay with family ahead of the storm. Albibi, a 40-year-old financial adviser with Merrill Lynch, said he's most worried about his parents, both 68, who decided to stay behind in Panama City Beach. Their home is about 12 feet above sea level — but the storm surge is predicted to top that. "I feel that they're taking it maybe a little lightly," Albibi said. "I tried to explain to them that this isn't similar to any type of hurricane." In Southport, Florida, just north of Panama City, Daniel Dean described widespread damage and debris. "There are trees — I mean trees on top of trees on top of trees on top of trees — that are just piled up in the roads," Dean said in a phone interview on MSNBC Wednesday afternoon. "There are power lines crossing the road," he said. "Right now it is just catastrophic out here in Southport ... we have garage doors that have been smashed in," he said, adding that the entire roof of a church had been ripped off. "There’s flooding everywhere," Dean said. "I have never seen anything like this in my entire life in the Panhandle region, ever." In Callaway, a town of around 14,000 just east of Panama City, Doug Jones was in his home when a tree fell on it, completely destroying the structure. "I was in the living room and heard a huge cracking noise," Jones, 50, who is a traffic technician for Bay County and said he stayed because he was on call for work, said in a phone interview. "All of a sudden, the roof came down. I had to jump into the hallway so it didn't fall on me." "I'm trying to save what I can. The house can be rebuilt, but our photos and everything are getting soaking wet," Jones said, becoming emotional. Although Jones is a Florida native who has lived through many, many hurricanes, he said this storm was particularly bad. "This is the worst hurricane I've ever been through," Jones said.